Another Mali Enterprising Leaders key project output that explores sustainable business models and effective succession planning to encourage participation of younger people and implementation of the next generation leadership. 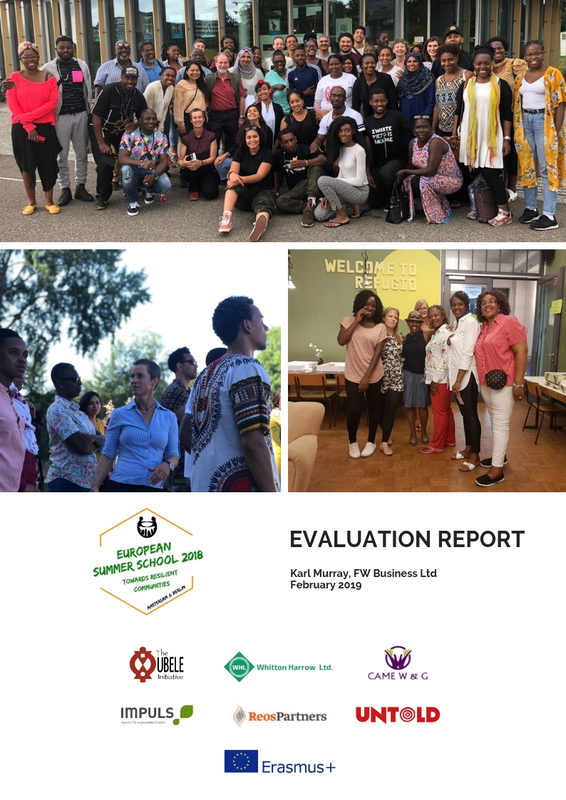 The report documents the evaluation of the MEL project through which we worked with 6 BAME community organisations inolved in business enterprise in London and Manchester. This is the first BME-led Community Enterprise toolkit. The need for it emerged as a key recommendation of the MEL Programme and from Ubele’s experiences of supporting community businesses and social enterprises. It highlighted an urgent need for BME communities to be offered targeted support, advice, capacity building and investment to enable them to both establish and strengthen Community Businesses. The 2018 ‘European Summer School: Building Resilient Communities’ follows up on the 2016/17 Erasmus KA1 Adult Education programme ‘Creating Resilient Communities through Social Leadership’ (CRCSL) which sought to give community organisations the opportunity to participate in social leadership training programmes. This report sets out the underpinning principles and approaches that is at the heart of the Ubele approach, capturing both the ’process’ as well as the ‘impact’ of the ‘Black to the Future - A Sankofa approach to Exchange Youth Work Practice' programme on participants, the organizations involved and future directions. Our project, called ‘Creating Resilient Communities through Social Leadership’ (CRCSL) was designed to give community organisations the opportunity to participate in social leadership training programmes that are rarely available to them and yet that could make a substantial contribution to their work in communities. This evaluation report seeks to provide a reflection of the PatHERways London project which took place between June 2017 and January 2018. It sets out the underpinning principles and approaches that is at the heart of the Ubele approach, capturing both the ’process’ as well as the ‘impact’ of the programme on participants as well as the organization. This report provides insight into an innovative series of group conversations facilitated by the Ubele Initiative and an afternoon festive market exploring food and community space based at Wolves Lane Horticultural Centre, Haringey. The experiences of Black, Asian and Minority Ethnic (BAME) led community organisations seeking to acquire and manage assets for organisational and community benefit is not well understood or researched. This case study explores the community asset transfer journeys of three BAME-led community organisations. This report was commissioned as part of the Awards for All funded programme that Ubele Initiative was successful in securing in 2014/15. The focus of this particular project was to transform and strengthen communities through developing the capacity and competence of ‘community leaders’. The project sought to recruit 20 volunteers, to be trained as ‘facilitators of change’ within their local communities so as to transform those communities. hOW MIGHT WE CREATE SUSTAINABLE AFRICAN DIASPORA COMMUNITIES THROUGH INTERGENERATIONAL LEADERSHIP, SOCIAL ACTION AND COMMUNITY ENTERPRISE DEVELOPMENT? This report reflects on learning which resulted from a Winston Churchill Memorial Trust Travel Fellowship awarded in 2012. Over the past nine months, Locality has gathered evidence and ideas from policy-makers, local leaders, organisations and communities across the country through evidence events, focus groups, calls for written evidence and survey responses. Yvonne Fields writes about The Ubele Initiative’s Partnership with Conway Hall. This Locality report seeks to change that by calling for a bold new programme of support for community asset ownership. This summary report was independently produced by The Choices Consortium in partnership with Blaksox, a community-led social action movement. It is a response to what are viewed as missed opportunities on the part of the Government, and the Home Office in particular, to effectively utilise what was learned from the Ending Gangs and Youth Violence (EGYV) Peer Reviews across the country in the aftermath of the 2011 riots. Yvonne Field writes about Chestnuts Community Centre is based in Tottenham, North London, which has one of the largest number of diaspora communities in England: African, Caribbean, Turkish, Irish, Polish, Jewish to name but a few.